Hi, all! I’m James. 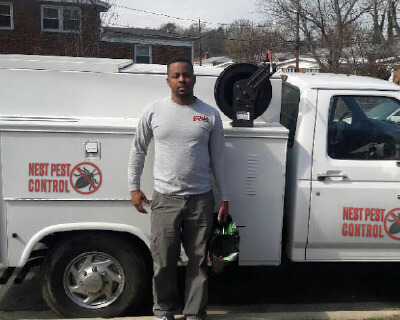 I own Nest Pest Control and do most of the dispatching and a lot of the pest control services here in Laurel, though I do have others that work for me that are competent and will treat you pretty well. 13 years ago, I started in the pest control services industry. Since then, Nest has grown well and we have become one of the top pest control companies here in eastern Maryland. We serve Laurel and all the surrounding communities between Washington and Baltimore. I’ve been really enjoying exterminating and controlling all sorts of pests from homes for many years. I can’t wait to help get rid of all the pests in your home (or your business, or your rental properties! ), too. Just because we’ve been doing pest control for a long time doesn’t mean we sit on our laurels. In fact, we are routinely reviewed as one of the best pest control companies in the area! We look forward to serving you and would like to give you a no-obligation quote for services. Call Nest Pest Control today and let us help you live pest free again! James at Nest Pest Control was the best! We were doing Airbnb and some guests brought bedbugs to our home. While we could only find them in the Airbnb guest room we opted for an entire house treatment as it was the only way they could guarantee extermination. Good thing we did! Weeks later we were still having problems in the guest room and now in our own room. James had to come back two or three times. Thank goodness the company guaranteed extermination for 90 days because despite all our efforts those little things can hide. Its now been 5 1/2 months since we found out about the bed bugs and we can say they haven’t come back anywhere in our home.